Here, a slightly different version of that Avatar can be seen in use on LinkedIn. I’ve kept you longing long enough. What you’ve been seeing so far — are not just backgrounds and Avatars — they are embedded examples of our shared future: Unique identifiers created using “Microsoft Tag” to virally promote a brand and cement a repressed need to belong. images) — into live links for accessing information and entertainment online. promotions, and more. Nothing to type, no browsers to launch! Are you following the how of why I’ve done this yet? With the right camera cell phone, you can “read” these Microsoft Tag images and then be automagically taken to a website embedded in the coded graphic. Are you now convinced I’m not really insane, but rather cagily helping re-brand my brands? Creating a new Microsoft Tag is easy. Once you create your Tags, you download them in .PDF format so you can resize and save them as image files — .JPG seems to translate better than .PNG — for your blogs, business cards, t-shirts, hats, notepads or other scheming promotion. What I like best about using a Microsoft Tag as my Avatar is that, by “reading” the image with your cell phone camera, you are able to independently confirm my identity. No hiding. No wondering. Read the image and you’re taken to the who of me. I suppose people could create a Microsoft Tag in your name with your URL to fake the who and what you are — but in the end, they’re only promoting your fame. Perhaps one day Microsoft will provide some sort of cross-checking key that will confirm the person that created the tag actually has the right to own that tag in the same way Google Analytics demands you verify you actually own the domain you claim. Using a Microsoft Tag as your Avatar means few people would actively want to steal your image identity — unless, of course, you want everyone on your staff to share the same Avatar to virally promote your business all over the world! 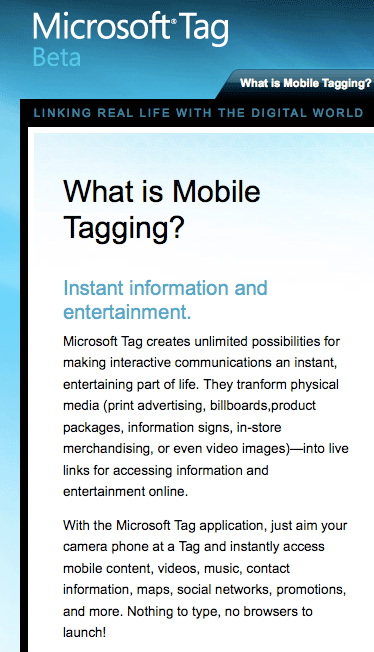 The delicious iPhone is the primary method I use for reading Microsoft Tags in print or on screen. I know Microsoft wants its Tag program to be used for selling items on the internet, but — like a rubber band serves to hold both a newspaper and a ponytail — so too, is the Microsoft Tag reader able to be multipurposed in many, expandable, ways. Once started, Microsoft Tag roars to life. Here is my first attempt to read the Microsoft Tag I’m using as a tiled background image on my Twitter account. Yes, the image is blurry and my hand unstable. I touch the “Use Photo” option anyway to send the Tag to Microsoft for reading. For my second blurry attempt, I pull back a bit, filling the screen with my Twitter Avatar background — and even some of my graffiti wallpaper from my MacBook Pro just to be persnickety — and I touch the “Use Photo” button again. The Microsoft Tag Reader accepts my image, calls up Safari, sends the image to the Microsoft Tag site for interpreting and I’m re-directed to BolesBlogs.com — all in the moment of the twinkling of an eye, and much too fast to grab the process in a series of screenshots. Microsoft Tag reader is certainly Panopticonic and surveilling, and inherently insecure, but since I am opting in on both sides of the coin — the creation of the tag and its reading — I am not put off by the invasion of my space, nor by the lack of a two-way identity key. In fact, I wonder if inking a Microsoft Tag on my forehead as my first tattoo would be readable by my iPhone — or have I taken my want for self-branding a byte too far? That made my day. 🙂 Thanks! I can understandthe whys and wherefores – might just do one myself. The result as an avatar is fine- as background ……… reaches for the sunglasses. Yes, I think MSFT Tags have a real future in making an Avatar live beyond just the mere image. Would the background be less bright if I used a larger size for tiling? I like the idea of a trackable avatar/trademark across the web – it is almost but not quite copyright. I like the idea of being able to search for content by known author/tag. Not sure what the answer to the twitter page is – I think the root of the problem is the colors themselves – snappy in an avatar – garish across a whole page. That’s it, Nicola! You can leave breadcrumbs of who and what you are all over the internet — and even create multiple “images” of your brand that lead to things to buy. You might change that Avatar daily to reflect new specials just to keep your followers actively engaged. I think you’re right about the colors being garish at any size — but it is sort of funny that those primary colors are all “web safe” and retro. SMILE! Love the new avatar, David! Finally you are on Facebook! Thanks for the kudos on the new Avatar, Katha! I could change that Avatar every day to sell a new book or promote a new website! I’ve been on Facebook for a long while now — way back when you had to actually be in a university to get access — I just don’t quite “get it” in the way I do with LinkedIn. Facebook seems slightly kiddish to me David, LinkedIn is way more professional compared to that, but sometimes it is a good tool to connect with friends who use it! That’s true, Katha. Facebook is probably more fun to use for more people than LinkedIn.